Caritas Zambia is concerned over the low maize price floated at ZMW60/50kg bag this year. Compared to last year, this is a ZMW25 reduction per bag in a situation where the cost of input and labour has gone up. It is evident that this price will not benefit small scale farmers in any way, but rather leave a farmer making huge losses from which recovery will be difficult. Apparently, low crop prices is not only associated with maize grain, it also applies to soya beans as well which has dropped from ZMW5 per kg to ZMW1.50. This situation reminds us of the words of the Prophet Amos to Israelites who were living off the poor farmers and swindling them of their grain. “Listen to this you who crush the needy and reduce the oppressed to nothing. You say, when will the new moon be over so that we can sell our corn, and the Sabbath, so that we can market our wheat? Then we can fraudulently tamper with the scales and even get a price for the sweeping of the wheat. Yahweh has sworn by the pride of Jacob, never will I forget anything they have done”, Amos 8:4-7. Buying grain from poor small scale farmers at low price when we know the price of production is exploitative and any person who care about the plight of the poor farmers ought to speak up. In as much as the 2016/2017 rainy season was favourable, farmers faced numerous challenges. The implementation and roll out of the E-voucher to 27 districts was not efficient and a number of small scale farmers experienced a lot of hiccups. Some of them did not receive inputs as late as March 2017 month end. There was also the problem of army worms which forced many farmers to lose money in replanting to replace the crop that was destroyed. The reduction of the prices will just add misery to the already impoverished households. We wonder if government considers the vulnerable small scale farmers who struggle to make the required contribution towards the E-voucher to access the inputs. Are the poor and vulnerable that do not have connections to briefcase buyers considered? Is the value of the little profit that these farmers make considered? If this is the way to promote agriculture in Zambia, then surely farmers must be wondering in awe. Many at times farmers have always been on the receiving end of the value chain as opposed to the consumers. 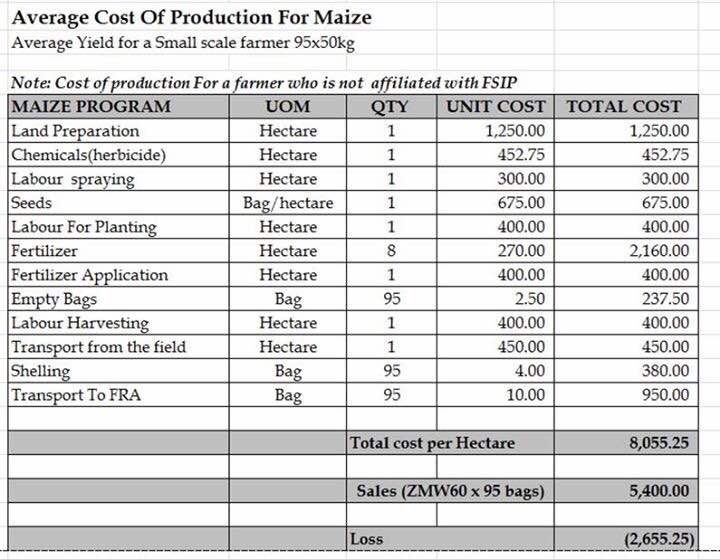 This crop marketing price will definitely yield discouragements for small scale farmers to plant Maize and soyabeans in the 2017/2018 farming season. Caritas Zambia would like to call on government to revise the price of Maize and Soya beans upwards to protect the farmers from bankruptcy. We also call upon the brief case buyers to remember the works of prophet Amos and endeavour not to exploit the farmers, otherwise they will have no crop to buy next year. It is time that government begins to move away from promoting high input agriculture which is unsustainable, especially for small scale farmers. Zambia needs to shift into sustainable agro-ecological type of agriculture that has already proved sustainable as its external inputs are low and is based on food production that makes the best use of nature’s already existing resources. Caritas Zambia, therefore hopes government, through the Ministry of Agriculture will shift its focus to the promotion of agriculture that sustains the health of soils, ecosystems and people, dependent on the earth our common home. A combination of traditional innovations and scientific research to benefit the shared environment for all involved in the ecosystem is the modern way of fighting climate Change. Caritas further wishes to urge government to always consider and consult vulnerable small scale farmers who take farming as a business when making important and costly decisions.